This custom 4-sided wood burning large fireplace Acucraft built for The Hermitage Club’s Grand Room is the largest wood burning fireplace Acucraft has ever built; measuring in at over 630 cubic feet (that can fit 140 of our Z-Max fireplaces!) with 75 sq ft of viewing area, this massive fireplace can hold up to 10′ logs! 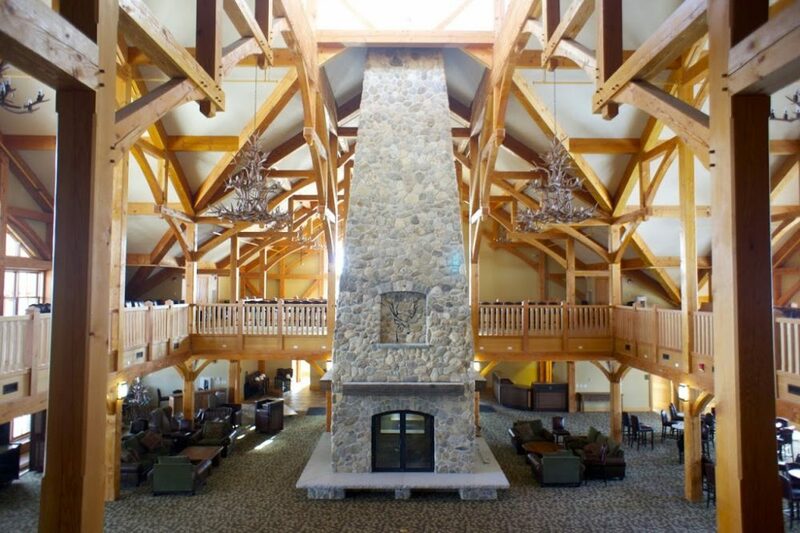 Due to the sheer magnitude of this large fireplace, it had to be dropped through the ceiling of the clubhouse using a crane. The firebox was constructed of 7-gauge steel for a masonry installation and lined with real firebrick. The custom arched doors are 5′ x 5′ designed with high temperature ceramic glass and basket handles. Due to the sheer size of this fireplace, by cubic feet and door openings, it required custom dual 18″ Class A Flues measuring in at over 500 sq inches. All of Acucraft’s wood burning fireplaces are equipped with Combustion Air Ducting. As demonstrated in the image below, outside air (yellow arrows) is pulled down the air intake and dispersed into the fireplace; the air then heats up and the smoke (red arrows) travels up and the flue. This fireplace can be used with all of the doors closed, using outside air, or to be used with one set of doors open or removed. Not even Santa could resist stopping by The Hermitage Club to checkout this fireplace! This fireplace was definitely a memorable one for Acucraft and we are excited to continue bringing our clients’ visions to life! A special thank you to The Hermitage Club for the opportunity, and some amazing photos! We’d also like to extend our gratitude to Robert Maccini, Construction Manager and the entire team at Austin Design – it was a pleasure working together! Want to lean more about Acucraft’s Custom Fireplaces, or even design your own?